My speech as Non-voting Chair of JudgesTM at Foyles, 24 August 2016. Gratifyingly well received. You’d think after thirty years it’d be easy to choose the Clarke winner – we’d turn up and all know that that novel is the one. But this year we had a tough time getting to a short list and a tough time agreeing on a winner. All of the books play with and reinvigorate the sandbox of science fiction – generation starships, ill-matched crews, AIs, parallel universes, mutants and have one or more moments of conceptual breakthrough, when you realise that the fictional universe is more complicated than you think. But I pointed to the rule that There Can Be Only One. Might it be Dave Hutchinson’s Europe at Midnight, follow-up to his Clarke shortlisted Europe in Autumn, with the Balkanised Europe now neighboured by a pocket universe consisting of a university, a pocket university, if you will? Of course, this is a very timely book, a very important book, said one of the judges, and we were deciding on a winner just over a week after the Brexit vote. This is my favourite book, said one of the judges. There’s a pocket world in Iain Pears’s Arcadia, which laminates together a Tolkien-esque author and their fantasy world, and time travel from the near future to a parallel world. Pears nods, of course, to Tolkien and Lewis, to Sir Philip Sidney and to As You Like It, as well as many other references. Pears’s app add to the reading experience, challenges the linearity of reading and adds to the pleasure of the novel. This is my favourite book, said one of the judges. Or might it be, Becky Chambers’s The Long Way to a Small Angry Planet, Kitshchie award-winning, originally self-published, lazily comparable to Firefly, but it does diversity and explores identity so much better than Whedon and almost effortlessly. Great fun, this is my favourite book, said one of the judges. Or might it be a book that has to overcome a phobia of many of its readers and at least one of our judges, Adrian Tchaikovsky’s Children of Time. This is an epic tale, told across generations, as the last of humanity think they have found a terraformed planet to settle, only it is defended by an AI who is protecting the dominant species of the planet, which has been uplifted (and the novel has at least one nod to David Brin). Defying disbelief, that species turns out to be able to defend itself more than adequately. This is my favourite book, said one of the judges. Alternatively, J.P. Smythe’s Way Down Dark is also set on a ship that has a voyage which will last generations –but here the passengers are awake, but society is falling apart. Chan has tried to maintain the Arboretum against the attacks of a savage gang. When her mother dies, Chan has to become leader in her place and save the ship. But nothing is quite as it seems and we are taken on quite a journey in the first of a trilogy. This is my favourite book, said one of the judges. Finally, Nnedi Okorafor’s The Book of Phoenix, a prequel to Who Fears Death, forces the reader to confront some interested moral questions in the choice of protagonist – in some ways it’s a superhero origin story, but in truth it is more complex. Phoenix Okore is a modified, accelerated woman, imprisoned in a skyscraper in New York. When she breaks out in search of the truth, it starts a bloody chain of events in Ghana and the U.S. This is my favourite book, said one of the judges. You can see our problem. What do you mean by favourite? Each year, for thirty years, the judges have to decide that for themselves. A different set of judges every year and a different favourite. How did they decide this year? Write the material using the wrong referencing format, so you can prevaricate by correcting this. It’s perhaps odd to think of landscape as political. It shouldn’t seem odd – humanity has shaped the planet with earthworks and agriculture and transportation across the centuries, and the ideological boundaries of course define it. Landscape painting goes further in its selection and depiction of topic, to write a nationality in oil or watercolours. We’re pretty pisspoor when it comes to Norwegian artists – we only really know Edvard Munch and we mostly know him through misreading The Scream. Add to that Johan Dahl and Peder Balke (to whom I will come back in future blog entries), and I fear the list is exhausted. Munch isn’t really known for his landscapes as such, more his figures in them, but his backgrounds are clearly psychological in nature. 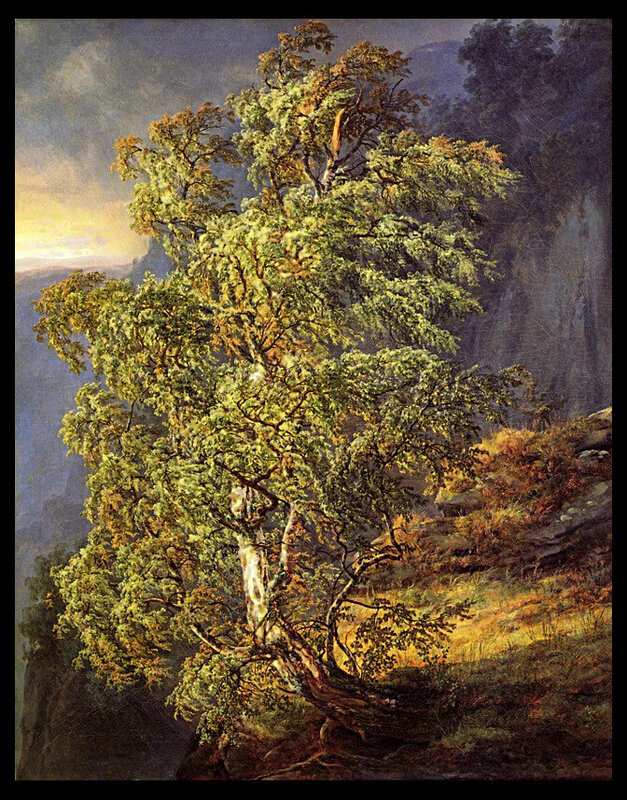 There’s a Dahl painting of a tree in one of the Bergen galleries, which represents Norway. This is presumably an echo, conscious or otherwise, of one of Caspar David Friedrich’s paintings of a tree, which represents Germany. Sylvan metonymy is the way forward – and no doubt a head scratching or two would recall an English oak to mind. Astrup (1880-1928) is an artist whose dates straddle the establishment of an independent Norway, and who is considered to be part of a generation of painters who were creating the country in paint – Norway had become ceded to Sweden from Denmark in 1814 and began fighting for independence, but it was not until 1905 that this finally came about. (I think there’s a set of artists, composers and writers in the 1840s and 1850s who were also working on this project, including Dahl.) Until the Dulwich Picture Gallery show Astrup had not been shown in the UK – and he was unknown to Andrew Graham-Dixon’s somewhat, uh, erratic, documentary on Norwegian art. The majority of canvases on show were landscapes – although sometimes there are groups of people, usually his family, whether siblings or wife and children, but also peasants planting or harvesting. The most relevant image here is seen best in A Morning in March (c. 1920), a twisted trunk with two branches reaching upwards and splitting, with narrower twigs radiating out. On closer inspection, the tree becomes personifiable, animorphic, as a stretching figure – yawning? Screaming? – with those branches as hands. In woodcuts, some earlier, the figure looks more masculine, in others seems to be breasted. Astrup was the son of a Lutheran minister and thus grew up both in a religious household and a damp one – the parsonage was not the healthiest of places. He seems to have spent many weeks in bed, presumably staring out of the windows, thus seeing the view in a variety of lights. Rather like Munch, although I suspect for different reasons, Astrup keeps returning to the same images – the same lake, the same mountain – but with different coloration. In painting different colours, he is painting different moods, which attach to spring, summer, autumn and winter. Alongside oils and water colours are wood block prints, carefully carved up from a number of different pieces of wood, ready to be applied with different colours of paint. (Remember, if you think this a primitive technique, that this was Escher’s preferred media.) Each time a block is applied, he has to wait for the paper to dry again – and the paper was liable to shrink and the block expand. A complex image like Foxgloves – which exists in numerous versions – might require twenty dryings before it was complete and a single bodge could ruin the image. Sometimes he would expand a print by adding oil paint ting, sometimes he would add it to an oil painting. 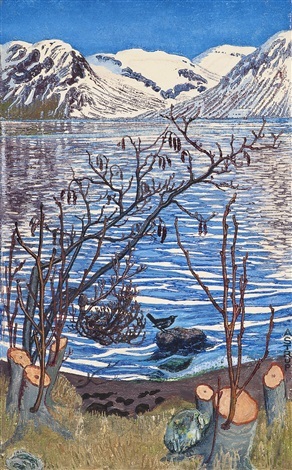 Whilst this was creating a national Norwegian visual language, he was inspired by the Japanese woodcuts he saw in Paris in 1902 and in London in 1908 – most clearly in the design known as Bird on a Stone, with a dipper on a stone on the edge of a fjord, a skinny tree in the foreground and mountains in the distance. The Japanese used water-based pigments, but like him pressed the paper against the block rather than vice versa. 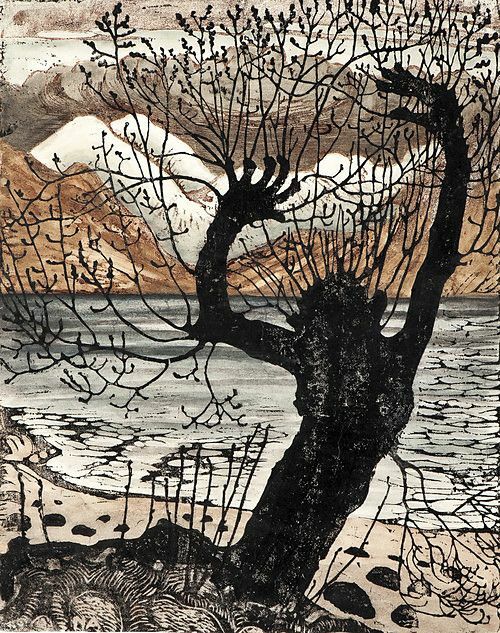 This layout was to lead to a set of images of tree, fjord and mountainside, made concrete in the woodcut cover design for Stein Bugge’s Vår oh Vilje (1916), Spring and Desire, where a closer inspection of the mountains in the background reveal a naked woman lying on her back – a recumbent ice queen. This segues into Spring Night and Willow and A Morning in March, in which the ice queen forms an opposition to the (male) tree troll. 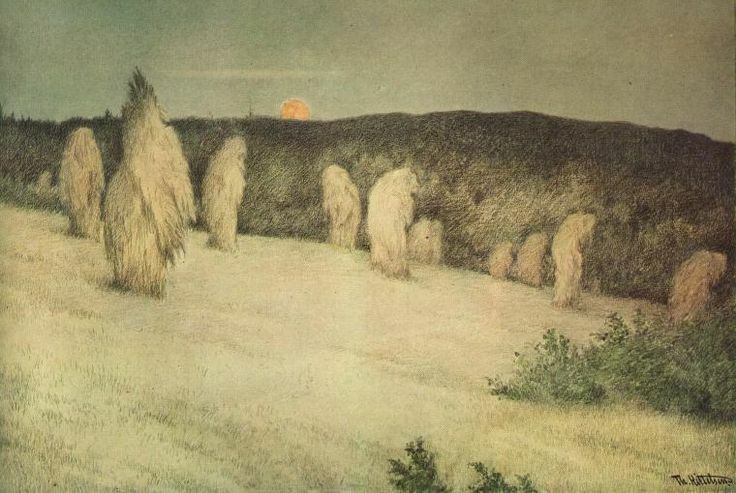 The same double take is necessary in his painting and prints of Grain Poles, where the wheat echoes the image of the troll – the catalogue helpfully points us to Theodor Kittelsen’s Troll Wondering How Old He Is (1911) and Grain Poles in Moonlight (1900), as well as pointing to a house as skull (Ålhus Church) and flames as dragons (Preparations for the Midsummer Eve Bonfire (1908)). Such haunted landscapes would have been at odds with his father’s Lutheranism – indeed the paganism or Norse mythology underlying the Midsummer Eve Bonfires that he was to repeatedly paint reflect a tension with a disapproving parent. He had to stand at a distance – away from its ungodliness and eroticism. But it has its roots in a mythology than underpins Norwegian identity. At the same time, a painting such as Autumn Dusk in the Garden (1902) has a warm light coming from the parsonage and he seems to have been upset by its fall into disrepair and demolition. The confluence of identity and landscape comes most clearly in his landscapes with marsh marigolds. These would include A Clear Night in June and A June Night and Marsh Marigolds. The vanishing of the flowers represents the passing of an earlier world and a nostalgia for it, as well as concrete evidence of agricultural development. 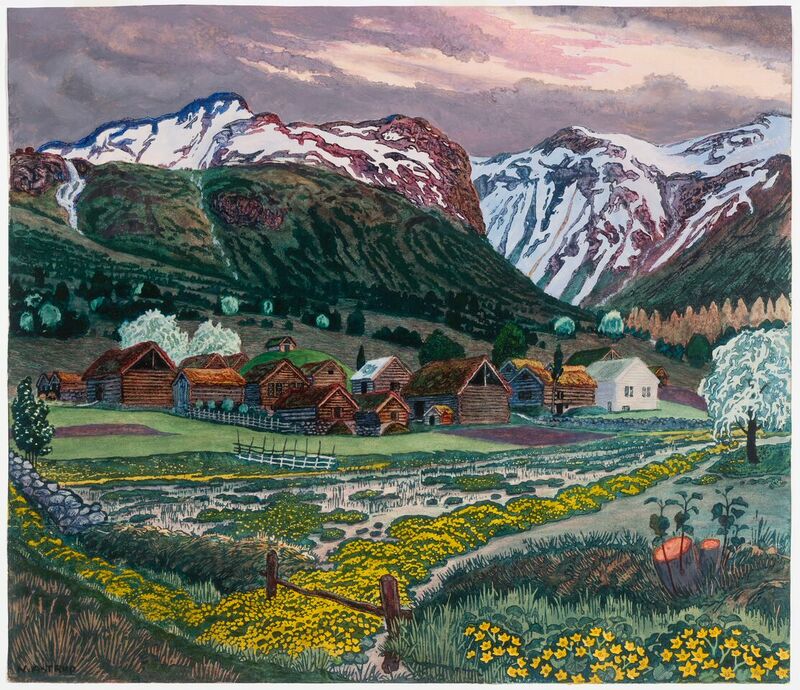 A number of Astrup’s paintings show the planting of crops or their harvesting, and in his later years he established a smallholding that was garden, house, studio and source of food. He experimented with traditional native plants and cross breeding. He worked on trees to turn them into trolls. At the heart of his work, then, seems to be the need to record a passing way of life in an industrialised age that then faced the horrors of the First World War. His paintings fix a past that generate a sense of a Norwegianness that had only just achieved constitutional identity and may yet disappear in a globalised world. The authentic Norwegian appears to be art, customs and costumes associated with the rural farmers and peasants, presumably on the grounds that they remained untouched by Swedish and Danish influence, with Norway isolated from the rest of Europe, in part because of a distrust of centralisation. More than this, I am not yet qualified to pin down – I evidentally need to do some reading.